The first November 1956 the Reparto Sperimentale Volo flight group of the Italian Air Force was born. The department was soon identified by the number 311 that is still present nowadays on the planes. To celebrate the sixty years of activities a dedicated commemorative livery has been developed and adopted on a Tornado IDS. It has been used during the commemorative event of' October 2016 ant it has generated a great interest and an impressive success. Today the “311” flight group is one of the most advanced aeronautical testing and experimental centres in the World and it is formed by highly trained and skilled personnel. The Tornado IDS, was developed by a partnership program, during the '70s, between Italy, Britain and Germany to develop a modern multi-role combat aircraft air attack. 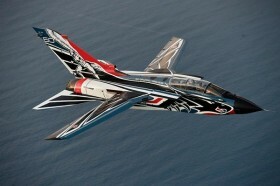 With almost 1,000 units produced, the Tornado is a milestone of the military aviation.